Two fantastic albums from Hugo Montenegro – back to back on a single CD! Hugo In Wonder-Land is one of Hugo Montenegro's best moog albums – and a killer batch of tracks written by Stevie Wonder – hence the title! Hugo and crew go to town with a host of electric keyboards – including moogs and Arps, backed up by some straight electric piano – and they lay down 10 smooth funky renditions of Stevie Wonder hits from the late 60s and early 70s. The approach is a great one, and it really gives substance to Montenegro's moogy musings – which sometimes can lack direction. Includes great versions of "Living For The City", "Too High", "Superstition", "Higher Ground", "You've Got It Bad, Girl", and "All In Love Is Fair". 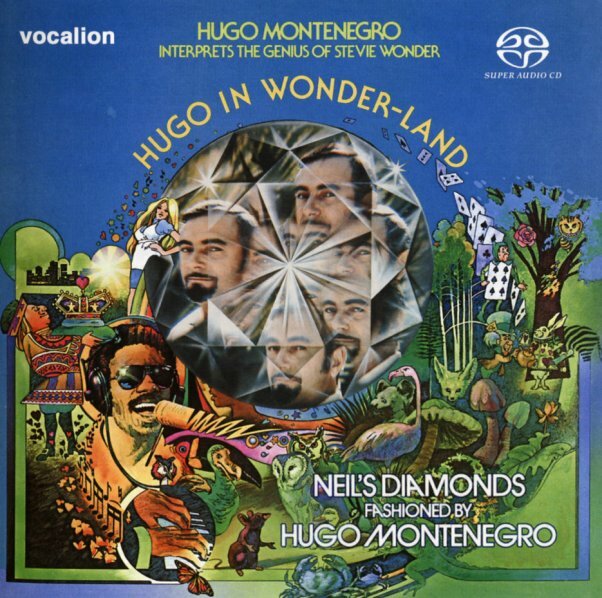 Niel's Diamonds is a weird and wonderful record – the early hits of Neil Diamond, played on the moog and ARP by the mighty Hugo Montenegro! The approach to the set is pretty darn cool – as it takes 10 of Neil's best early tunes, and runs them through arrangements by Montenegro that run from funky to groovy to dreamy – and which feature some very strange use of electronics! Sparkling and weird all the way through – with versions of "Girl, You'll Be a Woman Soon", "Brother Love's Traveling Salvation Show", "Sweet Caroline", "Two-Bit Man Child", "Porcupine Pie", and more! © 1996-2019, Dusty Groove, Inc.